Today, I get the pleasure of writing about two delicious topics...pizza and music! Good food and good music happen to be two of my favorite things, but I also get to share a much deeper topic and that's HOPE. Many of you reading this post may already know I spend a lot of time at my desk working online. As a work at home mom I can get really stressed out with trying to balance working from home and the day to day chores around our house. I can usually tell when things are getting to me too much, because I'll start to feel a sense of hopelessness. There's nothing worse than feeling like you have no hope even in the smallest tasks of life like the pile of dishes waiting for me in the kitchen! Music is a great motivator for me. I've always been more productive when I turn on some music. Taking my normal play list and switching it out for the new Living Hope CD from Pizza Ranch is not only a huge boost to my productivity it's a great mood enhancer too. You can't help but feel peace and joy when you start listening to the lyrics of hope from the artists. Read more about this new CD available for a limited time from Pizza Ranch, and enter for a chance to win a copy for yourself below. Adrie Groeneweg had a dream that started in Hull, IA, in 1981, when he was just 19 years old. It was simple. Why does everyone have to drive out of town to get a pizza? With just six specialty and single topping pizza recipes developed by Adrie's mother, Lorraine, Pizza Ranch was born. Pizza Ranch's vision and mission is to glorify God by positively impacting the world and to give every guest a legendary experience. They have 190+ locations across 13 states including Iowa, Minnesota, South Dakota, North Dakota, Wisconsin, Michigan, Nebraska, Illinois, Kansas, Missouri, Montana, Wyoming, and Colorado. 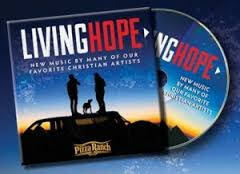 On June 2, 2015, Pizza Ranch released a CD called Living Hope containing twelve songs from many of their favorite Christian artists. Most of the songs are brand-new and written exclusively for this CD around the theme of Hope. Artists include Colton Dixon, Francesca Batistelli, Ellie Holcomb, Sidewalk Prophets, Kevin Max, Bart Millard, Passion Band featuring Kristian Stanfill, Michael W. Smith, and Mark Schultz. The CD will be available to purchase for $5 plus tax exclusively in Pizza Ranch restaurants or download the music through August 31. "This album has a very special meaning for Pizza Ranch. Although Pizza Ranch is not in the music business, many things have been happening, conversations have been taking place and doors have been opening for this album. Through these events, I believe it was obvious that God has been behind this for His specific purpose and putting it on our hearts to collectively create this project. As such, we call this our miracle album, Living Hope." Unfortunately, living in Indiana I've never been to a Pizza Ranch restaurant, however having family members in Iowa I've heard great things about their pizza. I'm excited for the day Pizza Ranch makes an appearance in my home state! Not having the opportunity to enjoy their food I feel connected to their company just by getting to know the heart behind their brand. I received a copy of the album Living Hope to enjoy and once again I've discovered another great Christian artist. I would love to share every song from the album in this post, but I'm just going to share my favorite "What Are You Waiting For?" by Sidewalk Prophets. This song and it's lyrics really hit home for me. If you're looking for some great songs about HOPE to get you through your work day or even to just play on your commute then the Living Hope album fits the bill. Enter for a chance to win a copy below! One lucky entrant selected by rafflecopter will receive the Living Hope album! (ARV$5) Open to readers in the US, 18 years and older. Open for entry from 7/27-8/3/2015 at 11:59pm EST. Please note: Only one entrant per mailing address, per giveaway. If you have won any prize from our sponsor Propeller / FlyBy Promotions in the last 30 days, you are not eligible to win. If you have won the same prize on another blog, you are not eligible to win it again. Winner is subject to eligibility verification. Winner will have 24 hours to respond to notification email to claim their prize or a new winner will be selected. Verification and prize fulfillment are the sponsor's responsibility. Use the rafflecopter below to enter. Good Luck!